ASRock introduced its second-generation Micro-STX gaming desktops with discrete graphics processors at CES 2018. 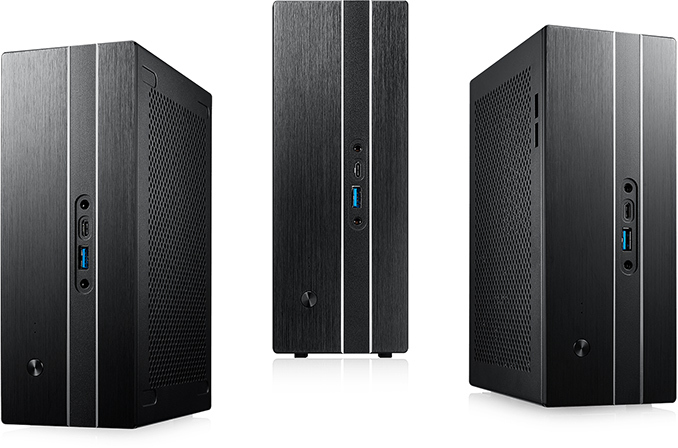 The new DeskMini GTX systems are based on the Intel Z370 platform and support Intel’s six-core Coffee Lake processors. When Intel introduced its 5” × 5” initiative (an initial name for Mini-STX) back in 2015, the company wanted to create a highly-integrated small form-factor platform with interchangeable processors for PC makers. The platform was not supposed to support any add-in-boards, and therefore wouldn't overlap with Mini-ITX and Micro-ATX. 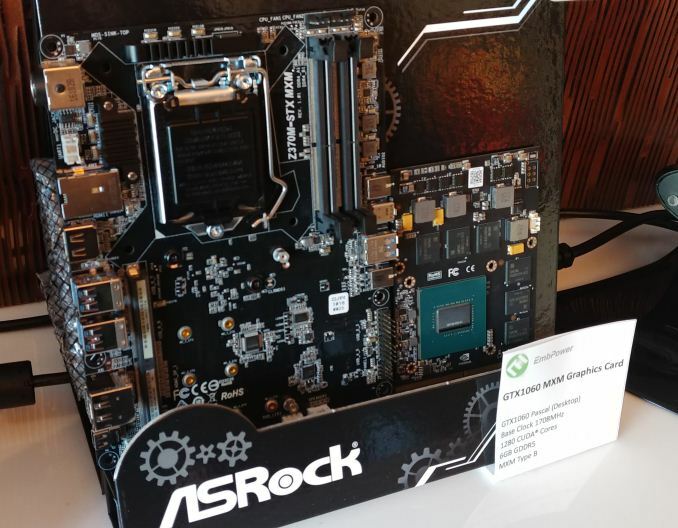 ASRock was among the first brands to jump on the Mini-STX bandwagon in 2016, but it did not take the company long to adopt the form-factor for compact gaming computers. In 2017, the company launched its DeskMini GTX/RX SFF gaming PCs based on its own Micro-STX form-factor, an extended version of Mini-STX with an MXM slot for GPU modules and three additional M.2 slots for SSDs. The initial ASRock DeskMini systems were based on Intel’s B250 and Z270 chipsets and therefore only supported Skylake and Kaby Lake processors. In the coming months, ASRock’s DeskMini SFF PCs will be upgraded with Intel’s six-core Coffee Lake CPUs. The new ASRock DeskMini systems that the company demonstrated at CES 2018 look exactly like their predecessors released last year and offer similar connectivity — 802.11ac Wi-Fi, GbE, USB 3.0 Type-A, USB 3.0 Type-C, DisplayPort, HDMI, 3.5-mm audio jacks, etc. 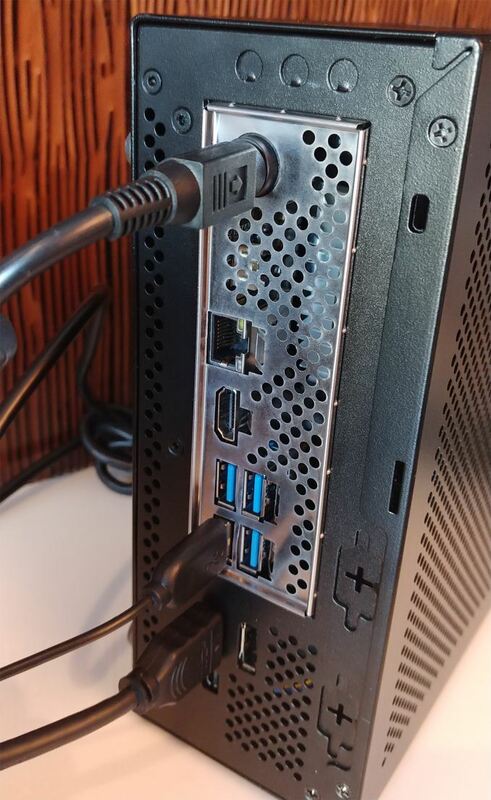 Meanwhile, the new DeskMini GTX systems are based on the Intel Z370 PCH, the six-core Core i7-8700 CPU and are equipped with a 270 W external power supply. ASRock will offer the new DeskMini machines with various MXM modules featuring different GPUs (e.g., GeForce GTX 1060/1070/1080, etc. ), memory and storage options when it ships them in the coming months. One of the high-end systems demonstrated at CES was outfitted with Intel’s Core i7-8700, NVIDIA’s GeForce GTX 1080 module, 16 GB of DDR4-3200 memory, a 32 GB Optane Memory drive, a 120 GB Optane SSD as well as a 240 GB PCIe SSD from Team Group. 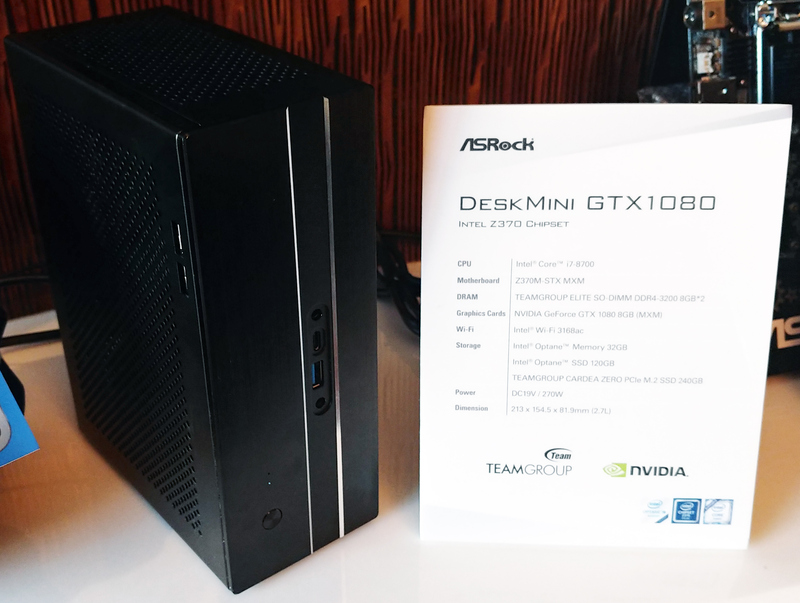 Exact ETA and pricing of ASRock’s new DeskMini GTX systems remain to be seen. I really like the idea of shrinking gaming desktops from their previously huge full tower cases to something a lot more shipping and desk space friendly. I see ASRock includes WiFi, but in the images there don't appear to be any antennas. Are those three circular breakouts near the power input the locations where wireless antennas would end up being installed? Yeah, it is from a certain point of view but I needed something as small as mini-stx...(Maybe mini-itx would do).